Black Swan has fashion editors' hearts aflutter over anything ballet-inspired and feathered. And while we can't all swan around in fabulous Rodarte tutus like its stars Natalie Portman and Mila Kunis, we can still evoke a bit of Swan Lake style in our holiday party looks. 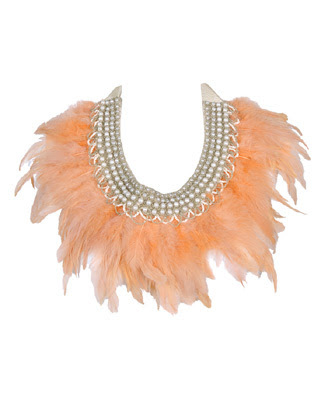 This feather collar from Forever 21 is one affordable way of doing so. The grosgrain ribbon tie, intricate beading, and fluffy blush pink feathers would provide a gorgeous dramatic accent for an LBD or a simple tee. If blush pink is too innocent for your tastes, it also comes in gray. The innocent white swan or the sensual black swan--which one are you? At the not-so-princely sum of $26 Cdn, you can afford to skip that decision and get both. Have you seen Black Swan yet? Not yet, but I'm dying to! The film was insane. Maybe to insane? Hmmm, black or white seems too black and white. Can I be the gray swan? I haven't seen the movie yet but I'm dying to & planning a date with my hubby to go see it once our pre-holiday craziness dies down a little bit. I want that feather collar! I would definitely rock that. i'm kind of a muddled brown swan... dude, saw the movie, wow, still deciding if i liked it. the cosutmes were amazing though! Love love love. That's all I have to say.